ISKCON bases its philosophy on the ancient Vedic literatures. These include the Bhagavad-gita, the 18-volume Srimad Bhagavatam, and the 9-volume Caitanya-caritamrita. Study of these scripture take place at ISKCON temples daily, and special narrations or sermons are often part of weekly community gatherings and festivals. In addition Srila Prabhupada started the Bhaktivedanta Book Trust (BBT) to publish his books and other authorized publications of ISKCON and to oversee the distribution of these publications. To date ISKCON through the efforts of the BBT has become the leading publisher and distributor of literature based on the timeless Vedic knowledge. Many of ISKCON’s publications have gained tremendous reputation among scholars worldwide and are even housed in the libraries of reputable colleges and universities. 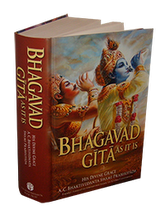 Srila Prabhupada’s Bhagavad Gita As It Is is the most distributed, respected and most read edition of the Gita in history and has brought many a seeking soul to explore its teachings through practicing in their own lives. Some of the BBT publications are listed below. You can click on them to read or browse through them online. Click here to download simple pdf copies of some of our books. To buy our publications including our Back to Godhead Magazine or to make any inquiries please feel free to contact our temples. For wholesale inquires contact Pavana dasa or Santa Vigraha dasa.